On 16th October a public debate was held in Parliament by The Media Reform Coalition. 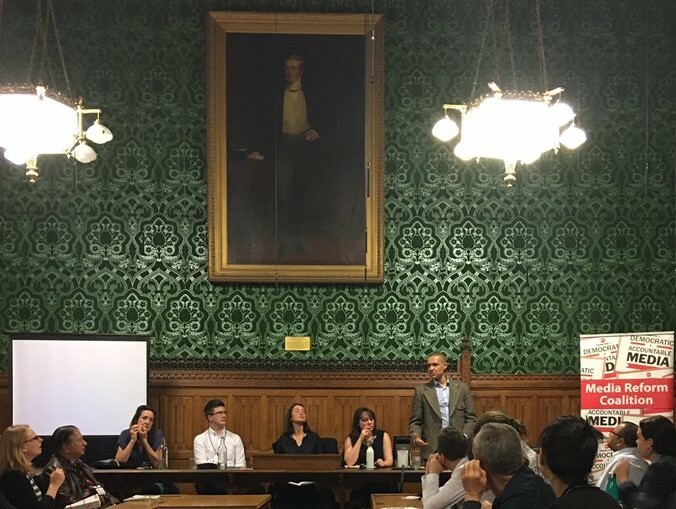 The speakers were Clive Lewis MP, Amelia Womack (Green Party) Tom Mills (Media Reform Coalition) and Zoe Williams (The Guardian), chaired by Natalie Fenton. The Media Reform Coalition began campaigning for reformation of our Media in 2011 and this event was the launch of their solutions to the issues facing our Publicly owned broadcasting service and how to keep it relevant in a digital age. You may wonder why a debate reforming the BBC took place less than two years after the Conservative Culture Secretary, John Wittingdale announced a number of reforms in January 2017 based on the findings of an independent review. The independent review was carried out by David Clementi, former deputy Governor of the Bank of England. A man that had neither experience of a broadcasting service or could be considered an independent voice. David Clementi is a businessman and has been and still is, chairman of numerous high profile businesses. He comes from a family of high profile men dating back at least a hundred-years including his Grandfather who was Governor of Hong Kong. After completing the review he was rewarded by John Wittingdale with an appointment to the BBC and he became chairman of the board. It is argued that an independent review should be carried out by a group of people, that represent the diverse community that an institution such as The BBC represents. Someone that has lived their life with a silver spoon in their mouth has no understanding of why democracy is important to working-class people and their version of democracy is what will prevail when we allow them to dominate our Governments and services. In a nutshell what the Media Reform Coalition seeks to do with regards to the BBC is to decentralise and democratise the institution. Tom Mills and Dan Hind, members of Media Reform Coalition outline in a pamphlet sold at the event for a reasonable £1 exactly what this reformation of the BBC would look like and are pleased that Jeremy Corbyn endorsed many of the reforms which they are campaigning for. Each speaker took turns to put a spotlight on what was important to them about The BBC and why they supported the reformation that The Media Reform Coalition was proposing. Tom Mills kicked off the event and he spoke about how The BBC is important to Britain as it represents our society, our communities but is also important worldwide. It is one of the most trusted news sources but that trust can be lost and can be very tough to regain. Tom Mills wrote a book called, The BBC: Myth of a Public Service, which was recommended highly, Clive Lewis went as far as saying “It is a brilliant book”. Though in this session, Tom focused on the contents of the pamphlet and discussed how the BBC is moving into the digital age and how it should respond to the changes this represents. Tom said it was imperative to preserve open access to the BBC, that a democratic media needs to be accessible to everyone. Tom Mills also highlighted the high concentration of private ownership of the press and inaccurate reporting. Whereas part of the appeal of the BBC is its fairness and balance which should be preserved and updated for a digital age. He aims to “take it out of the shadow of the state and put it into civil society so it belongs to the people that work there and the people in the public to who it is accountable”. This means making it independent of politicians and the state. A Radical re-organisation away from Westminster, away from Whitehall and away from London. To diversify the BBC so that it represents our communities and our country as a whole. Zoe Williams took a much more emotional stance on the issues affecting the BBC. She said: “What is wrong with the BBCs heart? because there is something wrong with the BBCs heart” She referred to allowing fascists a platform, which was, in fact, undermining impartiality and journalism. She shone a spotlight on the BBCs response to outcries against the programmes regarding Tommy Robinson. The BBC issued a tweet saying “It’s not the job of BBC journalists to pretend that things aren’t happening when they can see that they are.” Zoe, rightly remarked that there are things that are happening that the BBC ignores every week. Zoe ended her speech with a powerful thought regarding fascism. Amelia Womack spoke about how we hold a special place in our hearts for The BBC and we want it to improve because of how much good we know it can do but If we want the best from the BBC we need to reform it. She spoke about how The BBC is continually getting it wrong environmentally. ‘When you are talking about climate change and completely ignore science, you end up having a debate about if climate change is real rather than what the solutions are, that is dangerous’. She articulated why giving Nigel Farage so much airtime where he is blaming all our problems on immigrants, is dangerous because then we don’t debate problems like austerity, lack of housing, lack of investment in education and concerns about the NHS. Clive Lewis who sponsored the night’s event, started by reiterating a point that Amelia had made ‘The fact that the number of votes you get depend on the frequency you appear on our media, BBC, is a reflection of that unfairness’. Clive spent eleven years working with the BBC as a political correspondent for BBC Look East and he had some enlightening things to share regarding the media and journalism. He spoke of how we are currently in a pressure cooker, with Brexit, the rise of fascism and austerity. That a media that is both transparent and accountable is critical as we navigate our way through this turbulent period but a media that holds power to account. A lively discussion followed, which saw people questioning and adding their views to the debate. The event made a strong point for a more democratic future for The BBC, it tackled changes to its funding and moving it away from Governmental control. It tackled how it keeps up with private competitors in a digital age and how it represents the diverse community that it serves. You can also find a recording of this session here. Finally, if this topic is important to you The Media Reform Coalition offers a Media Activist Toolkit and ask that you write to your local MP and write to Tom Watson who advocates for Leveson 2 and may give an ear to media reform if we ensure he hears this debate.